Since we all wear different size shoes, they make their socks in Small, Medium and Large. It makes sense, right? 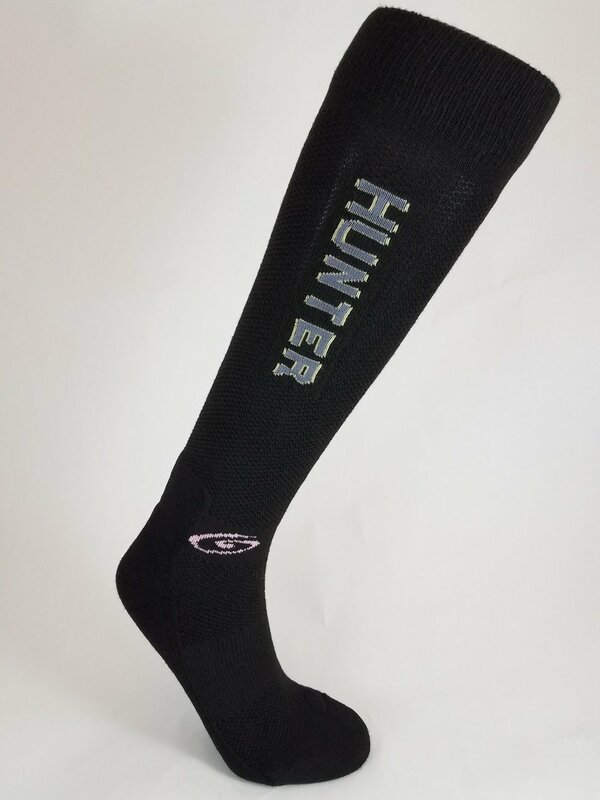 CONSTRUCTION: Foot Huggies Equestrian Tall Boot Socks comes from feedback of top competitive riders, amateur riders, and equestrian enthusiasts. We spent years testing fabrics, different ideas on padding, sizing, hot and cold environments, washing, drying, you name and we tried it! We had tons of fun creating the best sock ever! RESULTS: Amazing padding, Great Support, Invisible Toe Seam, Basket weave for light weight and thinness, COOLMAX® and LYCRA® Technology, all lend to a sock made for YOU, THE HIGH PERFORMANCE EQUESTRIAN! What Does All This Technology Mean? Basket weave allows a light weight sock with breathability and thinness where padding isn’t needed.YAY! SUPPORT: Their 2” welt, ankle support and arch support keep your sock in place where it belongs! No more chasing your sock from down around your ankles! Double padding inside the calf lends an extra barrier to help prevent bruising and soreness from your stirrup strap and saddle. Extra padding along the Achilles tendon aids in relief from friction from your leather boot. Continuous padding extending along the bottom of your foot adding comfort and a barrier between the construction of the boot bottom and the delicate bones, tendons and soft tissue of your feet. The padding continues up and around your toes, creating a reinforced toe box, helping keep your toe from tearing through your sock. 6. The ALL important Toe Box & Invisible Seam; Their seam closure is created on the same machine as the final step in finishing before being removed. Most other socks seam closures are done as a separate process leaving bulky corners which lead to calluses and corns where the seam ends and rubs. Their invisible seam placement is one of the MOST IMPORTANT elements of their sock design! -Their seam is placed high up, away from the end of the toes, just where your foot bones meet your toes. REASON: Calluses & Corns are created by poorly placed seams rubbing on joints & bones. Their seam fits on the sweet spot where there are no joints and bones! Toe Box: Their socks are a LEFT & RIGHT because our feet are a LEFT & RIGHT! They created a graduating toe box starting at the big toe down to the little toe allowing for a comfortable, roomy fit . With their creative approach, they were able to have a fit that allows for your toes to grip your stirrup irons through your boot without a bunching sock getting in the way of your performance. This also allows blood flow to your toes, keeping them awake! Happy Toes! TO ORDER press the picture of your choice, this will take you to the page where you can read more about the sock and about sizing! "COOLMAX® EXTREME: THE ULITIMATE PERFORMANCE FABRIC™ of INVISTA®" Brand.